Is renting a storage unit convenient? Yes! Convenient because you can rent a storage unit any way that works best for you! Face to Face: You’re welcome to come on down and see us and we will help you one on one. Phone/Fax: Give us a call and we are happy to accommodate your needs over the phone and can fax any needed paper work. Email: if you have any questions or comment, please send us an email. We check our email often and will be happy to respond as quickly as we can. Is renting a storage unit easy? We make self-storage Easy because we offer professional, friendly, convenient and secure storage that gives you the freedom to sign up and manage your account in the absolute best way that works for you. Call 406-220-1170 to set up auto-pay or sign up in person. We'll automatically debit your bank account or charge your VISA®, MasterCard®, Discover® or American Express® credit card for your monthly bills. Make payments online at www.businessparkstorage.com – we accept PayPal, VISA®, MasterCard®, Discover® or American Express® credit cards. Please include your storage unit number on your check or money order. Pay your bill at Business Park Storage with cash, check or credit card. Give a call at 406-220-1170. Our friendly manager will be happy to help you. What sizes of units do you have? 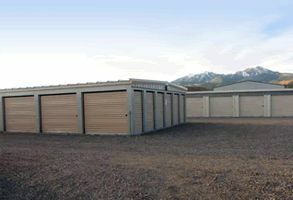 Business Park Storage offers a wide variety of unit sizes to meet your needs. Our storage sizes range from 5'x10' to 10'x50' and about 8' high these dimensions are approximate. You can always come out and measure your unit at the facility for suitability. We also offer large 1000 sq ft plus storage options. These units are ideal for household goods, RV's, warehouse, light industrial and commercial use. Sizes range from 1000 sq. ft up to 9000 sq ft and retail space. These units feature offices, bathrooms and are finished throughout. Conveniently located off of Interstate 90 at 7 Business Park Rd, in close proximity to Livingston Health Care. Does Business Park Storage provide locks? Yes! You can purchase a new, sealed lock. We have locks available for your convenience. Do you keep a key to my storage unit? No one else has a key to that lock —just you. If you prefer to provide your own lock, you're welcome to do so. Does Business Park Storage have drive up units with roll up doors? Yes! A drive-up unit has a roll-up door, much like a garage door, they roll up overhead for easy access, and its own loading area. Just drive up to it and load your belongings in or out. What's the difference between an indoor unit and an outdoor unit? Indoor units are protected from the elements. Outdoor units offer the convenience of drive–up access. Do you offer RV, Boat, Car, Motorcycle parking? Our facility does offer spaces for parking vehicles or vessels. Check out one of our large capacity units for inside heated parking options. Our rental contracts are month–to–month agreements — no long-term lease is required. When will I have access to my storage unit? Business Park Storage is open 7 days a week. What are the access hours and office hours? You have access to your storage unit 24 hours a day 7 days a week. Face to Face Office hours are Monday thru Friday 9:00 am — 5:00 pm. Our Manager is available to provide in-person face to face customer service. We will be happy to help you and will be available for answering questions, selling supplies, accepting rental payments and other questions or comments you may have. You may also feel free to use our contact tab and send us an email. We check emails often and will respond as quickly as we can. Do you have moving vans? Yes. We are proud to be an authorized Uhaul dealer. Please call 406-220-1170 for help booking available trucks, vans or trailers. Yes. We have a retail store onsite for all your moving and storage supply needs. We have a wide selection of boxes, furniture pads, dollies, packing supplies, pad locks, towing accessories and much more. Stop in weekdays 9:00am – 5:00pm to check out our selection. More Questions? Give us a call at 406-220-1170.